Hamas announces plans to carry out a series of public executions in Gaza. Hamas is planning to carry out a series of public executions in Gaza, the attorney general in the Palestinian enclave said on Sunday, according to the AFP news agency. 13 men, most convicted of murder connected to robberies, are currently awaiting execution, Hamas official Khalil al-Haya said on Friday at the mainly weekly Muslim prayers. “The victims’ families have the right to demand that the punishments be implemented,” he said, according to AFP. Hamas has in the past conducted executions in Gaza, although rarely in public and mainly of people accused of collaborating with Israel. The group executed 18 men in August of 2014 for collaboration with Israel. The last public executions in Gaza were that year, during the last war with Israel, when a firing squad from Hamas’s armed wing shot dead six men before Gaza City’s main mosque following prayers. Sunday’s announcement marks the first time that public executions will be those convicted of criminal offenses. According to the Palestinian Center for Human Rights (PCHR), nine death sentences were handed down in the Gaza in 2015 and two in the Palestinian-Authority assigned areas of Judea and Samaria. So far this year, around 10 more have been handed down in Gaza, according to AFP. 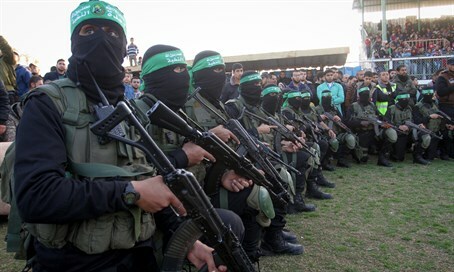 The PA has in the past blasted Hamas for carrying out executions, saying they had been conducted illegally outside of the Palestinian court system and could thus not be considered to have gone through fair process. Under Palestinian law, collaboration with Israel, murder and drug trafficking are all punishable by death. All death sentences, however, require the approval of PA chairman Mahmoud Abbas, who issued a moratorium on death sentences in 2005. Hamas ignores the moratorium and carries out the executions anyway, as it no longer recognizes the legitimacy of Abbas, whose four-year term expired in 2009.